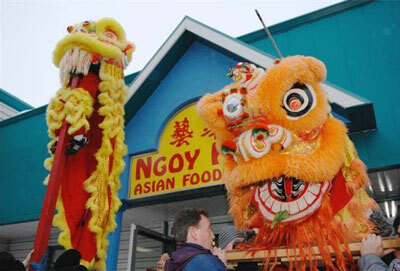 Ngoy Hoa Asian Foods Limited, located in Regina, offers several specialty items. These include Oriental groceries, spices, Thai, Japanese, Korean, and Chinese items, dim sum, and seafood. We also have a variety of fresh fruits and vegetables. Our store is family owned and operated, serving the area since 1991. In addition to tasty, hard to find food, we offer money remittance and phone card services. Our staff speaks many languages including Chinese, Vietnamese, Cambodian, Burmese, and French in addition to English to serve a wide range of customers. Our goal is to be every customer’s one stop shop. We want to provide you with the best possible experience, so feel free to ask our staff for assistance in finding the products you need. If we don’t have a certain product in stock, we will try and get it in for you. For a cold, refreshing treat, try our bubble tea, made fresh in store, or purchase the ingredients to make it at home. In the winter, we have an assortment of snacks, cakes, and envelopes for the Chinese New Year. Stop in to see the variety and experience the excellent service for yourself.